A Boat parade in the Florida Keys should have the gentle tones of "Deck the boats will boughs of holly………" as its theme tune. Come and watch a festive boat parade of between 30 and 50 lighted boats as they glow their way through the Backwater sound. Jimmy Buffett actually sings a song about Christmas, where Santa delivers your presents in a canoe, and yes that’s the way Santa does it down here in paradise. And yes it’s inherently Florida Keys. The majority of the local fishermen and boat owners really go to town with the parade, and drape a huge amount of flashing and blinking lights around their boats, and then let their imaginations run wild. At recent events, we’ve spotted Santa Claus catching a sailfish and Frosty the Snowman water-skiing. We've seen Rudolph the Red Nosed Reindeer, being unusually adventurous with sparklers from his antlers and his red shiny nose an inch of the water, as he skimmed across the water on a bright red surfboard. The kids love it, and take great delight in the more daft things that appear out on the Florida Keys water. As with the Fourth Of July Fireworks, the best coastal viewing locations are the Caribbean Club Senor Frijoles, Sundowners and Marriot Key Largo Bay Beach Resort. And for many of them, the hotels and facilities host barbecues with live entertainment, so there is certainly something for everyone. Admission to these special events is free, but you must be a patron at any of these facilities to enjoy the show (and of course their food) from these locations. Make sure that you check the local press for details of when this special events occur, as they are usually held in early December, but do vary slightly. Here are details as reported in the Keysnet.com. 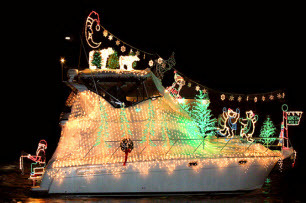 The Boot Key Harbor Lighted Christmas parade sets sail with dinghies, enormous and expensive yachts and other vessels as they cruise around the harbor with lights a twinkling. Best places to go and view the proceedings include the Marathon Marina, Lazy Days South, Burdine's Waterfront and Dockside Lounge. The Key Largo parade hits Blackwater Sound, with the best places to view the parade are most definately Sundowners, Senor Frijoles, the Caribbean Club and the Marriott Key Largo Bay Resort, all near mile markers 103 and 104. This boat parade that is organised by the Schooner Wharf Bar fills Key West Harbor with fantastically well decorated lighted vessels from tiny rowboats to some amazing tall ships. The whole things will then make its way around the historic seaport. There are no reasons for anyone to be excluded as long as you have a boat, the parade visits cuts and canals, and then passes by City Hall not one, or twice, but three times! Sadowski Causeway and the bit behind City Hall are prime locations for viewing the goings on. 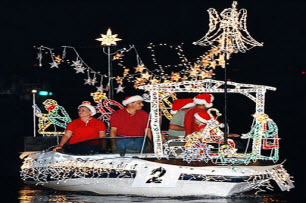 The parade down in the Lower Keys is the last of the season, and anyone who has a boat can take part in the boat parade including dinghies, deep-sea cruisers, canoes and kayaks. Santa Claus, and his lovely wife Mrs. Claus will make an appearance to give out delicious candy to the delighted kids. If you are looking for a place to get the best vantage point then go to the Parrotdise Waterfront Bar & Grille, Pine Channel Causeway, or 183 Barry Avenue on Little Torch Key.